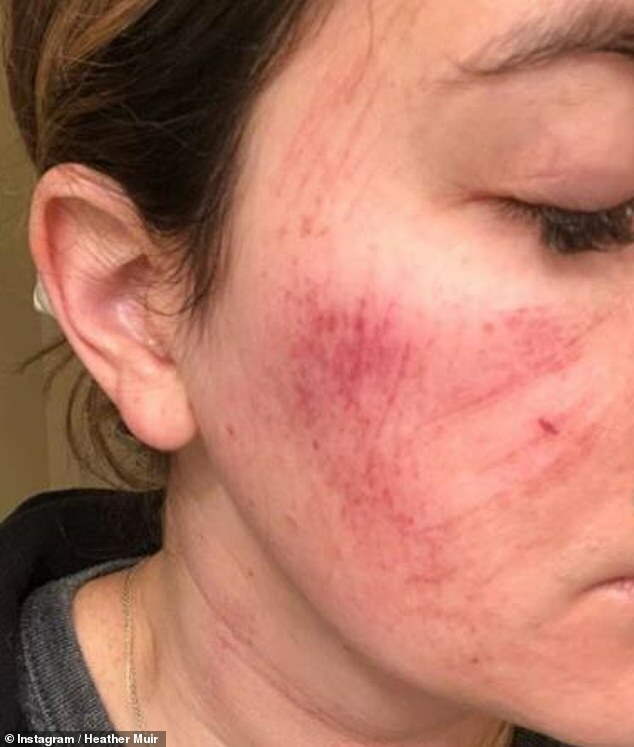 A woman who shared pictures of her red, scratched and raw skin after a facial gone wrong has detailed to followers why it is important to speak up if a procedure doesn’t feel right. 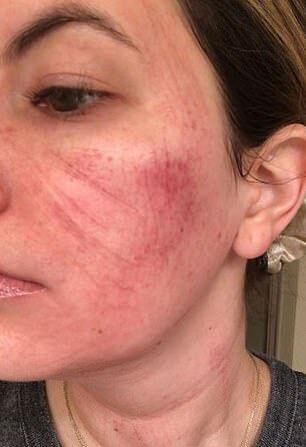 Heather Muir, 34, beauty director for Health and Real Simple, posted horrifying images of her face on Instagram earlier this week after she experienced a free ‘red carpet’ facial to try for her job. 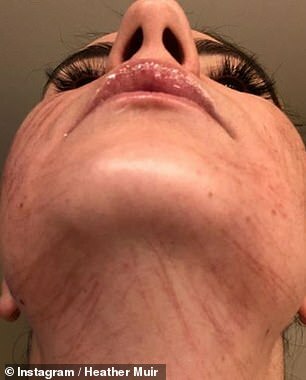 ‘Like I’ve done many times, I jumped at the chance to experience a fancy (free) facial, after confirming there would be no downtime, as I was filming hours later,’ the post continued. 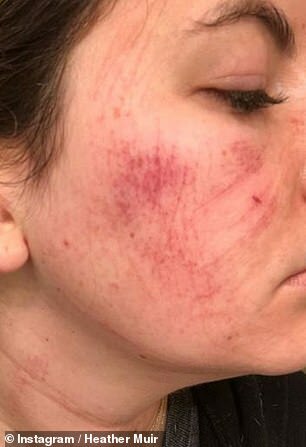 Heather explained that she was not trying to put a company or esthetician ‘on blast’ by sharing the horrifying images of her skin, however she said she felt it was her ‘journalistic duty’ to inform followers about the ordeal so that others might learn from her experiences in the future. ‘Numerous times throughout this facial, I felt uncomfortable, which I verbally expressed as burning, stinging, and on fire,’ the beauty director explained. But the esthetician refused to admit that anything was wrong with Heather’s skin despite the redness and scratch marks across the surface. ‘I was told, “Well, that’s what I was supposed to promote,” and to drink lots of water and moisturize with the oil capsules I had been given,’ Heather wrote. 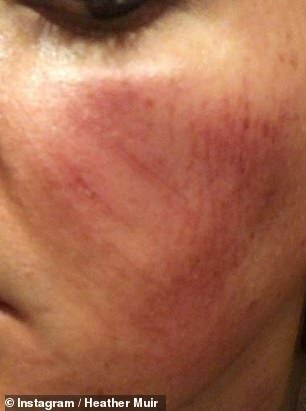 She shared multiple images of her face from different angles to show followers the redness and scratch marks that covered most of her cheeks and neck from the ‘red carpet’ facial. Included in the post was also a picture of Heather slathered in special cream from a dermatologist to help treat the wounds along her skin. Alongside the gut-wrenching pictures, Heather also made sure to share a message for her followers about what lessons they can learn from her experience with the bad facial. This sentiment was echoed by celebrity esthetician and skincare expert Renee Rouleau, who explained to DailyMail.com that there are a few simple, but effective, rules people can follow in order to ensure that they feel safe and comfortable going into a facial. 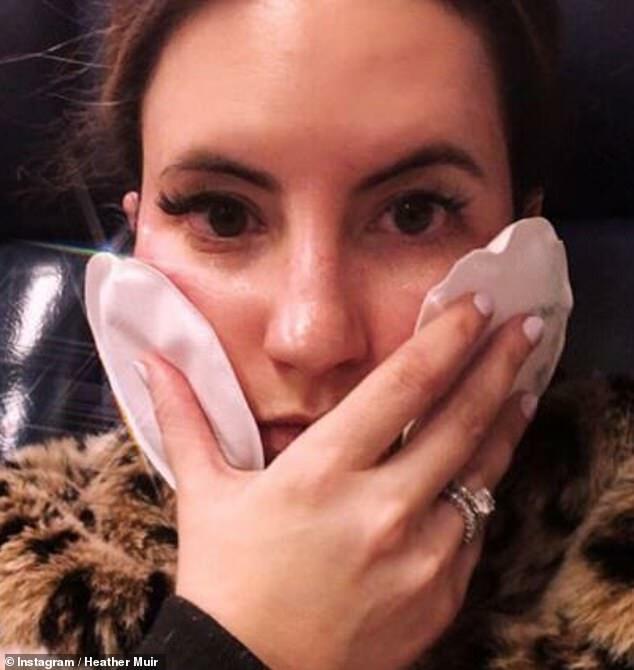 First Renee, who has worked with the likes of Emma Roberts and Demi Lovato, advised that you try and secure a consultation with your chosen esthetician before your appointment so that you can discuss your skincare concerns and get a sense of what treatment they might use. ‘In order for you to get the most benefits from your facial experience, you should think beforehand about the top three most important priorities for your skin,’ Renee explained. ‘This will allow your esthetician to be able to customize your treatment or recommend the best facial. You should also tell your esthetician if you have any skin sensitivities. Renee also said that it is wise to avoid using exfoliating products – any scrubs, acids, or retinols – for at least four days before your treatment, explaining that most facials will include some kind of exfoliating treatment ‘such as an enzyme or acid peel or ultrasonic exfoliation, and you don’t want to over-sensitize your skin’. 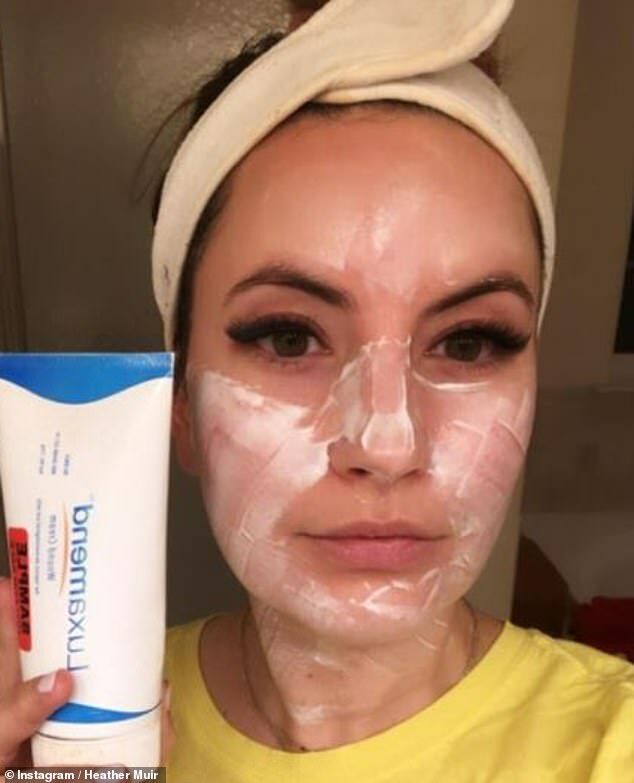 Similarly, it is best, Renee advises, to avoid trying any new skin treatments before a big event, on the off chance that you end up having an adverse reaction. Finally, the celebrity-approved skincare guru suggests doing some research to find out what products and treatments will really work for you, advising: ‘Read magazines, search online and ask your friends for recommendations. ‘People are talking online about their skin and experiences and although you have to be cautious when reading reviews, it can be a helpful starting point. 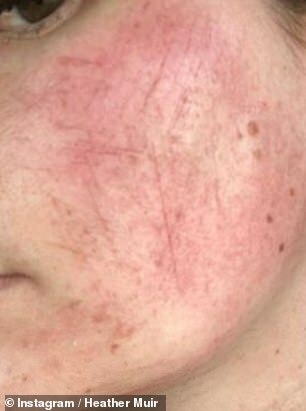 Thankfully for Heather, despite the shocking appearance of the red marks and scratches, she said she knew her skin would heal in time, and she noted that she was prescribed a wound cream by a trusted dermatologist that helped her complexion to look and feel ‘almost back to itself’ in just a matter of days. 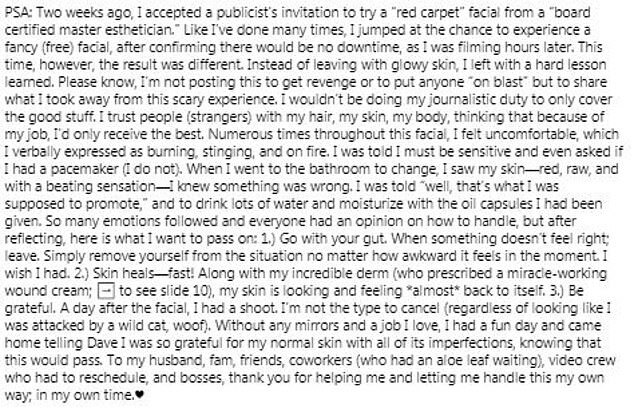 The beauty writer added that she is ‘grateful’ for the help she received from people in her life after experiencing the bad facial, and she praised her bosses for allowing her to ‘handle this in my own way, in my own time’, without forcing her to expose her skin to the public before she was ready.